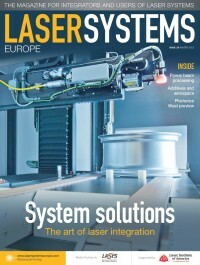 Laser Systems Europe complements Electro Optics by targeting integrators and users of laser systems. Registered readers are able to make an informed choice when selecting a laser system to incorporate into their own manufacturing processes, from textile cutting to automotive production, from medical devices to printing machinery and beyond. The content helps users choose which laser is best for a particular application, point them in the right direction for advice, and explore the process of laser integration, all by way of application-led editorial features and expert opinion from leading industry figures. Laser Systems Europe is supported by the LIA, the international society for laser applications and safety. Its mission is to foster lasers, laser applications, and laser safety worldwide. Serving the industrial, medical, research and government communities, the LIA offers technical information and networking opportunities to laser users from around the globe. The title has close links with major industry events, including Lasys, where Laser Systems Europe hosts and sponsors the Lasers in Action Forum, a three-day programme of case studies and technology developments delivered in a dedicated area within the exhibition. Laser Systems Europe is published four times a year (February, May, September and December) to coincide with major industry events, and is available for free to qualifying individuals in either print or digital format. Marketing options include display advertising, outserts, and inserts, as well as enhancements to the digital version, such as video overlay. 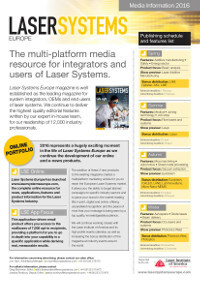 As well as showcasing features from the magazine, the website, www.lasersystemseurope.com contains pages of web-exclusive news, products, white papers, analysis and opinion, case studies, event previews and webcasts. Alongside traditional banner advertising, marketing options include white papers, sponsored content, and webcasts. There is a regular email newsletter: LSE App Focus, themed around specific applications of laser systems.